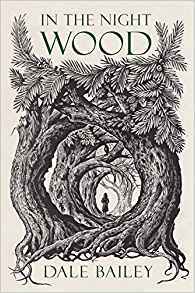 In the Night Wood, Dale Bailey (Houghton Mif­flin Harcourt, 978-1-328-49443-6, $23, 224pp, hc) October 2018. Cover by Andrew Davidson. Charles and Erin Hayden move to England following the accidental death of their young daughter Lissa. Erin is descended from Caedmon Hollow, the author of In the Night Wood, a children’s book from the Victo­rian era. As the last survivor of the family, she gets the Hollow estate: a lot of money, a house, and the Eorl Wood, a piece of primeval forest so thick and menacing that the house is literally surrounded by a wall to keep it out. Charles, a literature professor, wants to write a book on Caedmon Hollow, while Erin loses herself in grief and in various medications. Both of them start seeing a nightmare figure from Hollow’s book, the Horned King, on the wall and in the wood; both start having dreams and occasional visions of their daughter. This is relatively standard suspense/horror ter­ritory, and, although it’s well executed, the plot develops predictably, with, of course, portentous excerpts from Caedmon Hollow’s book, a ci­phered note containing dark family secrets, and flashbacks to family life before everything went wrong. Charles’s past infidelity lurks between him and Erin and prompts the question of whether their marriage can recover, little girls from the village start disappearing, and you could set a watch by the appearances of the Horned King. Unfortunately, the Horned King is not quite the figure one might expect from the mythological roots of the name, neither the Welsh Arawn of Annwn nor the more English Master of the Wild Hunt, but a creature composed of leaves, which turn color as he ages. This makes him an avatar of the Green Man, as seen in countless pieces of folk (and yard) art, and therefore inexorably conjures up Kingsley Amis’s 1969 classic horror novel, also The Green Man. In that book, the Green Man is also specifically a danger to little girls, a non-folkloric association: while he may, in May processions, sometimes chase pretty women, usually in a comedic fashion, he isn’t usually dangerous at all. The similarity between the two novels is therefore so striking that I suspect it of being intentional. If not, it is an impressive dis­play of parallel evolution, especially since Amis also focuses on adultery and on the question of whether a man can redeem himself by saving a child from a predator. I have never either encoun­tered or heard of any other books using this myth in this direction. However, if Dale Bailey means his book as a commentary on or response to the Amis, it’s not at all clear what he’s trying to say. 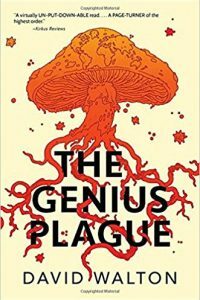 Bailey’s version has a great deal less sexual sleaze, a protagonist far more pleasant to spend time with, and far more conscious interaction with horror literature and its tropes. Bailey is thoroughly intertextual, quoting and crediting, among many others, Coleridge, Lewis Carroll, and Christina Rossetti. Amis is not mentioned. Sadly, Bailey also lacks the wordcraft, wicked wit, and nauseating verve which make the Amis an aggravating master­piece – a comparison I would not draw so thoroughly if the child-predation-Green-Man aspect did not isolate the two books in being about the same extremely precise subject. This is not to say that Dale Bailey’s book is bad. The characters are well-drawn, the cipher is clever, and there’s a neat use of symbolism to make subtle comparisons between the characters’ roles in various iterations of the Horned King’s rebirth. Bailey isn’t quite sure what to do with Erin, beyond making sure she’s active at the finale, and the final resolution is a little pat, but the prose is genuinely good, the setting is genuinely creepy, and the hints of a deeper, more compli­cated mythology that run through the book are legitimately numinous. Predictability does not strip away the charms of the scenes as they arise, and even though we already know why what will happen happens, there remain interesting myster­ies about who will cause it, in what way, and how. In addition, Andrew Davidson’s cover is not only beautiful and evocative, but a careful and intriguing rendition of a piece of in-story artwork, the visual taking inspiration from the verbal in a way that actively enriches both.